1. 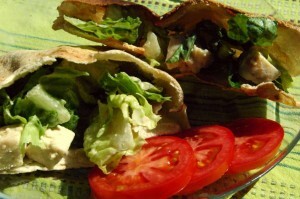 Cut pitas in half and open up pitas. Put pita haves in the toaster. Toast the pitas and let cool. 2. Meanwhile, mix together the ingredients from the salad kit (except for the croutons) with the chicken chunks. 3. Stuff the toasted pita with chicken Cesar salad mix.